U.S. stock futures fell Wednesday after a government report showed that the U.S. economy contracted during the fourth quarter of 2012. Gross domestic product declined 0.1% last quarter, marking the first year-over-year contraction since the second quarter of 2009. The drop was a big surprise, as analysts were expecting that the economy grew 1% last quarter, according to a consensus estimate from Briefing.com. Futures for the Dow Jones industrial average were down about 0.1%, while S&P 500 and Nasdaq futures slipped 0.2%. Ahead of the report, futures were little changed. Also on the economic front, payroll processor ADP said private employers added 192,000 jobs in January, higher than the 175,000 jobs that analysts were expecting. The ADP report is the first of three this week to provide a snapshot of nation's job market. In corporate news, the launch of the long-awaited BlackBerry 10, which the ailing Research in Motion (RIMM) hopes will change its fortunes in the smartphone market, is slated for Wednesday. Shares of RIM rose 2% in premarket trading. Boeing (BA), which has been dogged over the past few weeks by problems with its now-grounded 787 Dreamliner fleet, topped fourth-quarter earnings forecasts. The aircraft makers says it does not expect a significant financial impact from the grounding of the 787s. Shares of Boeing edged higher. Amazon (AMZN) shares climbed 9% after the online retailer reported a 22% increase in fourth-quarter sales late Tuesday. Oil producer Phillips 66 (PSX) shares rose after the company's beat earnings expectations. Facebook (FB) headlines the list of firms reporting after the close. Shares of Chesapeake Energy (CHK) surged 10% in premarket trading after the natural-gas producer announced that embattled CEO Aubrey McClendon will retire in April. In the afternoon, the Federal Reserve's Open Market Committee will release a statement upon the conclusion of its latest meeting, which investors will scrutinize for clues about when the central bank's bond-buying program will end. Minutes from the Fed's December meeting showed that some members were weighing whether the central bank should wrap up the program, known as QE3, before the end of this year. "While we expect QE3 will end before year-end, the Fed is in full-speed-ahead mode now," said Jim O'Sullivan, chief U.S. economist at High Frequency Economics in a note to clients. "We see virtually know chance of officials suggesting that QE3 might end soon in today's statement." While O'Sullivan is not expecting any significant changes to the central bank's statement, he does anticipate that policymakers will "at least acknowledge the improved tone in financial markets -- globally as well as in the United States." U.S. stocks closed higher Tuesday, pushing the Dow and the S&P 500 closer to new all-time highs. The Dow is less than 2% away from its all-time high of 14,198.10 reached in October 2007, while the S&P 500 is less than 5% away from its record high of 1,576.09, also reached in October 2007. European markets were down in afternoon trading. Asian markets finished with solid gains, led by Japan's Nikkei, which gained 2.3% to close above 11,000 points. 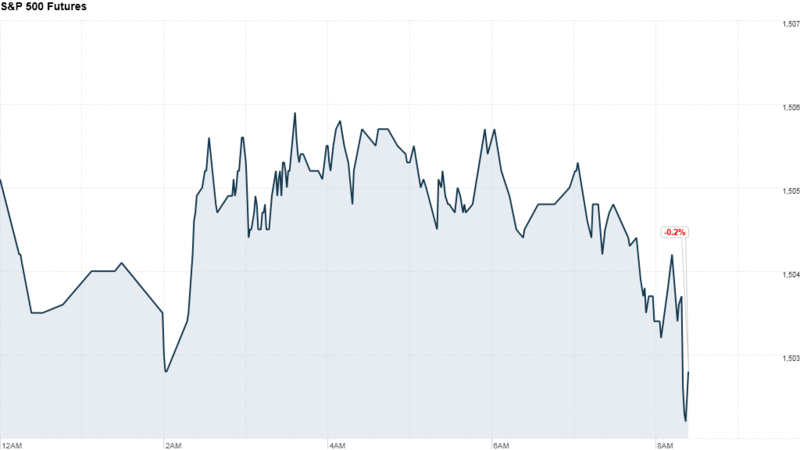 The 10-year yield on the U.S. Treasury was solidly above 2% as prices declined. The yield first topped 2% on Monday for the first time since April 2012.